Non-isolated switching regulators can be configured to have a negative output voltage with the addition of two capacitors. Figure 1 shows the configuration. However, the maximum power they can regulate at their outputs is less than their rated power when used to have positive voltage. 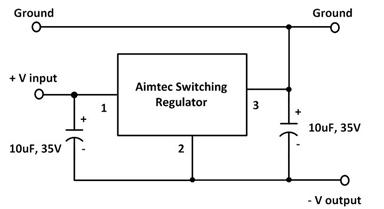 All Aimtec 78xx series switching regulators support the negative output configuration as shown above, however output current will be reduced from expected output in positive output configuration.